People interested in fitness want to know which are the best foods to eat before a workout and exactly when is the best time to eat them. Also there are lots of misconceptions about this subject, if we should or not be eating before exercising. To optimize your performance, you need to eat. You should never eat too close to the time you will be working out, because your body needs time to digest the food. Exercise on a full stomach could cause digestive problems. Eating before a workout also prevents low blood sugar, which leads to light-headedness and fatigue. Also you don’t want to eat the wrong things before your workout. Choose foods that provide fuel for the body such as carbs and eat protein to help your body build muscles and supply nutrients to all of your cells. Here are the best foods you can eat before your workout so you can fuel up the right way. You get a good mix of natural sugars, plus the protein and good fats from the peanut butter which lower the foods glycemic index, resulting a slower release of sugars into your bloodstream. That’s how you can keep going harder for longer. Before an intensive workout we need carbs. A mix of complex and simple carbs is the perfect combination. The whole-wheat toast with fruit gives you both types of carbs and they are super easy to digest. Bananas are perfect in raising potassium levels, which drop when you sweat a lot. This combination of protein and carbohydrates will keep you going for hours. Just remember, a little bit goes a long way. Seeds and nuts are high in fat, which means they take longer to digest. Cottage cheese has no lactose and is considered an excellent source of protein. Fruits like blueberries or kiwis provide the vitamins, minerals and antioxidants needed for your workout. If you need the extra energy for longer endurance, add a banana. Bananas have more carbs than most other fruits. Oats are full of fiber, which means they gradually release carbohydrates into your bloodstream. Oatmeal will boost your energy level and help you have a better workout. Oats also contain B vitamins, which help convert carbohydrates into energy. Fruit smoothies are high in carbohydrates and high-quality protein. They’re easy to consume and are rapidly digested. Try blending 1/2 cup plain, low-fat yoghurt 1/2 cup fruit and 1 cup fruit juice. You need to put fruits in your smoothies because the protein does not break down fast enough to become fuel for your workout. 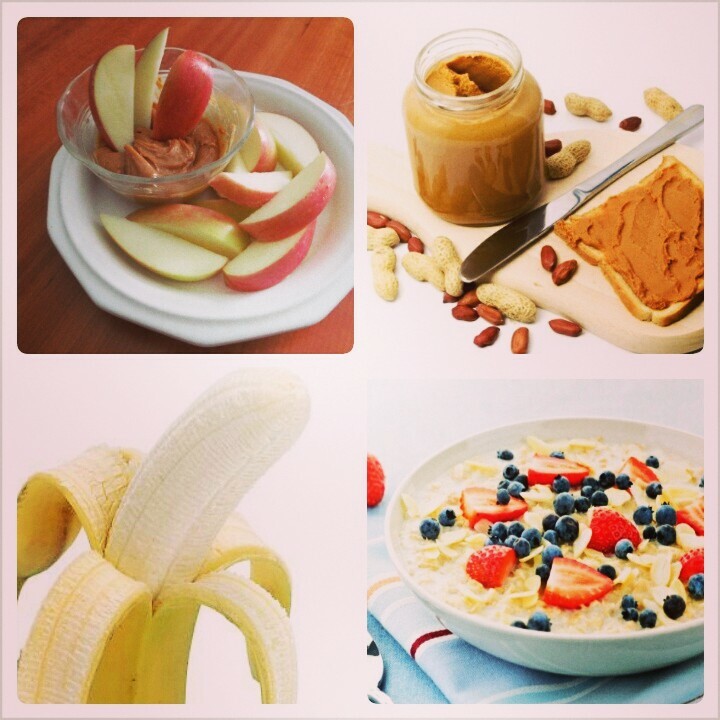 The carbs from fruit break down quickly and the protein is used later to prevent muscle damage. Be sure to avoid fatty foods before working out—fat leaves the stomach very slowly, which means you’ll feel full and could cramp up easily. Although carbohydrates are good, you should not get them from raw sugar or candy. Either of those foods will cause a sugar rush and probably a crash while you’re working out. Avoid overeating before you workout. These are all snack – not meal – suggestions. Eating too much can cause indigestion, nausea or even vomiting. « Most popular fitness myths! I’m not a body builder or power lifer but I swim a lot, and that is what I do and love it! I swim 1 to 2 miles daily, and think this page is brilliant for what I do and hope you expand on the nutritional section as much as you like! Good put up. I discover 1 factor far more difficult on totally unique blogs everyday. It ought to at all periods be stimulating to research articles from unique writers and stick to a little small bit some thing from their store. I’d desire to work with some together with the written content materials on my weblog no matter if or not you don’t head. Natually I’ll provide you having a web site link on your web weblog. Thanks for sharing. These are all fab, i normally have Banana on toast before my work outs but how long should i be waiting after eating to work out? Thank you for sharing! on this subject, it may not be a taboo subject but usually folks don’t speak about such subjects.